NYKCS is a leading franchised distributor of circular connectors and accessories for use in Military, Aerospace and harsh environment Industrial applications supplying approved product to markets around the world. We are fully approved to AS9100 Rev D (value added assembly) and AS9120 Rev B (sales, logistics and distribution). NYKCS supplies and assembles high-quality electrical connectors and accessories for use in military, aerospace and industrial applications. We provide an extensive range of mil (military) spec circular connectors including MIL-DTL-38999, 5015, 26482, 83723, EN2997, ESC10 and circuit board connectors as well as related products such as circular connector contacts, adapters, backshells, cable clamps and protective covers. We also specialise in the supply of hermetic connectors and connectors with hyperboloid contacts that are designed for use in harsh environments. Importantly, this broad selection of military connector products enables us to support large projects with the most demanding electrical and mechanical requirements. The company is approved to AS9100 Rev D for value-add assembly and AS9120 Rev B for distribution offering assured supply that is underpinned by a fully integrated quality management and order workflow system. That's why NYKCS can provide customers with dependable access to approved and certified components. All products are from trusted OEM manufacturers thereby removing any possibility of counterfeits entering the supply chain. This breadth of supply ensures a complete range of the latest components. For these reasons, we are able to fully meet our customers current and future needs for circular connectors and accessories. NYKCS has an unbiased position and is, therefore, able to select the very best solution for its customers. Working closely with our franchise partners and suppliers we are able to provide access to a wide range of approved component options backed up with specialist technical advice and excellent customer support. For a full list of our franchises and suppliers please click here or contact the team today. Our customers and the markets they serve require high-performance products that meet extreme demands. They also require a similar high level of ongoing service and technical support to enable them to deliver and maintain their mission-critical projects. At NYKCS we understand these needs and therefore provide a high level of product knowledge and experience backed up with flexible supply options. 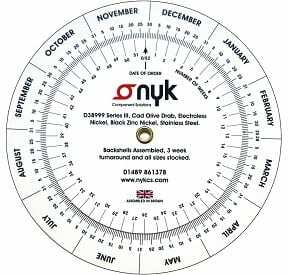 NYKCS also offers customised supply solutions that are designed to fit perfectly with your logistics procedures. This could be tailored supply via EDI or simply a quick response to ad hoc orders. In other words, NYKCS is the best choice for a flexible and reliable supply of approved and mil-spec interconnect product. The circular connector market is technically complex with multiple manufacturers and this can make component selection difficult. With this in mind, our aim is to remove complexity and ensure our customers have the right solution for their application. Most of all, we are committed to sourcing the best and most suitable products. How can we supply circular connectors more efficiently than an OEM? The best answer is to compare us and let our service speak for itself. Working with NYKCS you will benefit from an experienced and knowledgeable team. We aim to quickly become an effective extension of your own team. Are you new to the world of circular connectors? For information about the terminology used download our guide here. This provides a useful A to Z covering all the common terms used in the industry.